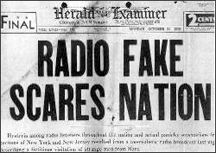 A headline from the Chicago Sun-Times about the War of the Worlds broadcast in 1938. From the report of the US Federal Communications Commission, courtesy U.S. National Archives. Dave looked impatiently at his watch, and then thrust his right arm forward, palm first, signaling "Halt." Everyone in the room stopped breathing, and Eileen instantly knew she was in trouble. She stopped her report in mid-sentence. "Dave?" she said, looking at him. "Something?" "Yeah, something," he replied sternly. "What's the headline?" "I was just getting to the headline. Can I continue?" Wrong answer. Eileen did continue, but it might have been smarter to have just answered him with her headline. Smarter still: lead with the headline, and then offer the details as an option. And that's my headline: Deliver the Headline First. For the details, read on. The headline is the consequence of the situation, taken as far as you can take it. For instance, a headline might be: "We can't finish on schedule." But if you've worked out the range of finish dates, the headline might be: "We'll be late by three months with 95% confidence." Evidence is fact. Reasoning is the chain of inferences drawn from the evidence. Hunches are informed guesses, consistent with evidence. Drivers are perceived benefits or risks that you combine with evidence, reasoning, and hunches to reach a headline. Say the headline to yourself. Then ask, "So What?" If you have an answer, then it's probably a better candidate headline. Repeat until you can't answer "So What?" For instance, if you start with, "We'll be late by three months," and your so-what answer is "We need to figure out now what to do," then perhaps the real headline is "We'll be late by three months and we need to figure out now what to do." Most managers prefer the headline first because they want to know possible consequences. Since they sometimes also want the details — the evidence, reasoning, hunches, and drivers — offer the option: "Do you want the detail?" Suspense tends to encourage people to imagine trouble. Delivering the headline first guides the minds of the recipients. If they do ask for detail, then as they listen, the headline guides their thinking. If, instead, you deliver detail first, they don't know where you're going, and they might imagine things less wonderful (or even worse) than your headline. When delivering bad news, we have a tendency to be indirect — to avoid clear statements that describe the event and its consequences. This practice can actually make things worse, and it can create significant additional cost. See "The True Costs of Indirectness," Point Lookout for November 29, 2006, for more. Would you like to see your comments posted here? rbrengAlabhNEjBHpUGPxner@ChactBVEHQzjQvfusdfOoCanyon.comSend me your comments by email, or by Web form. See also Effective Communication at Work and Managing Your Boss for more related articles. I offer email and telephone coaching at both corporate and individual rates. Contact Rick for details at rbrenInMrpnKUlgPwnDLNner@ChacgUKpEBsshDdyFAkboCanyon.com or (650) 787-6475, or toll-free in the continental US at (866) 378-5470.